Anne Kelly rang in a new chapter of her life on Monday. Surrounded by family and her healthcare team at our Walker Family Cancer Centre, Anne struck the Celebration Gong to mark her last chemotherapy treatment. 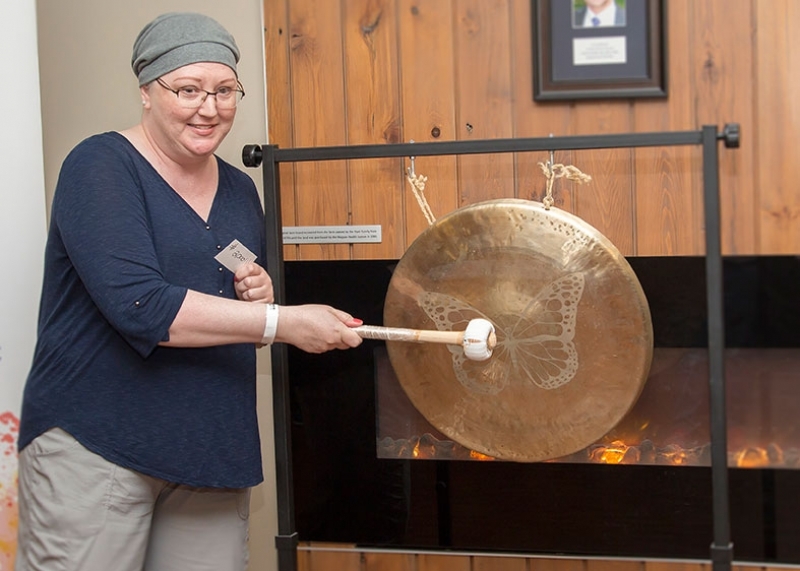 She is the 2,000th person to strike the gong, which is a symbol representing the journey to wellness the patient has just completed and the new journey they have begun. Anne recently completed her 30th chemotherapy treatment. Anne and her husband, Greg, credit the cancer centre team for guiding them along their journey, including the nursing and patient registration team, her social worker Donna Cook and her oncologist, Dr. Janice Giesbrecht. Watching Anne strike the gong was Deb Pogoda, a Registered Nurse in Chemotherapy who was part of her care team. Deb, who has witnessed hundreds of people strike the Celebration Gong, says patients are inspiring.